The European Commission adopted its most ambitious plan in 26 years of telecoms market reform with the goal to "reduce consumer charges, simplify red tape faced by companies, and bring a range of new rights for both users and service providers, so that Europe can once again be a global digital leader." 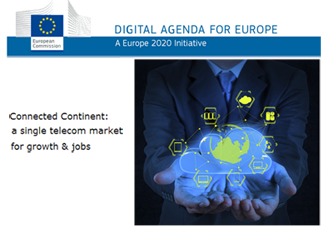 The “Connected Continent” legislative package, which was outlined by Commission President Jose Manuel Barroso in his 2013 State of the Union speech, will lead to the EU-wide and roaming-free mobile plans; make it easier for companies to operate across national borders; establish the first-ever EU-wide protection of net neutrality; and abolish premiums for international phone calls within Europe. Incoming call charges while travelling in the EU would be banned from 1 July 2014. Companies would have the choice to either 1) offer phone plans that apply everywhere in the European Union ("roam like at home"), the price of which will be driven by domestic competition, or 2) allow their customers to “decouple”, that is: opt for a separate roaming provider who offers cheaper rates (without having to buy a new SIM card). With LTE now the preferred radio technology in the majority of handsets it sells, AT&T is preparing its network for LTE-Advanced, said John Donovan, AT&T's Senior Executive Vice President of Technology & Network Operations, speaking at Bank of America Merrill Lynch 2013 Media, Communications and Entertainment Conference. This means implementation for carrier aggregation for the company's 700 and 850 MHz spectrum, leveraging self-optimizing network (SON) capabilities, and enabling higher order MIMO at the towers and handsets. Donovan said AT&T's goal is to extend the lead it has established at the fastest and most reliable network in the country. A specific timeline for the activation of LTE-Advanced was not given. LTE-Advanced smartphones will also be required. 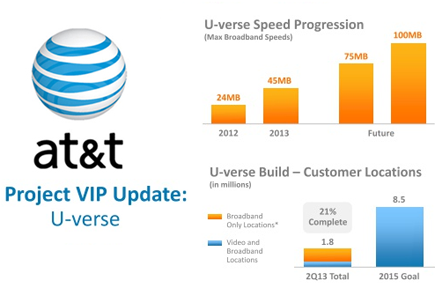 Currently, AT&T has LTE coverage in 397 markets covering 240 million POPs across the U.S. Donovan said the network is performing at a high level thanks to its distributed core architecture, use of remote radio heads, and extensive implementation of Ethernet/Fiber backhaul. Approximately 90% of traffic currently flows over the Ethernet/Fiber backhaul. Project VIP, which was launched a year ago, is on track, said Donovan, with 45 Mbps wireline broadband service now available in 17 states. The fiber footprint expansion to SMBs is also on plan. This new architecture is more CAPEX and OPEX efficient, which should deliver long term gains for the company. Donovan also discussed how LTE could make sense as a fixed broadband service in areas where spectrum is available. AT&T is looking at external antennas that could be mounted on the side of a home. This would be a local play in areas where upgrading the copper network is not economically viable. The presentation is archived online. GENBAND has acquired fring’s Over-the-Top (OTT) mobile IP communications service for consumers. Financial terms were not disclosed. The fring app, which is available for both iOS and Android, provides free mobile group video chat, 2-way video chat, voice-only calls and text chat over IP. GENBAND will offer a white label version that will let service providers and mobile virtual network operators (MVNOs) compete with OTT solutions. fring reduces roaming costs for subscribers by moving voice and video sessions away from radio access networks and routing them over the Internet. GENBAND said fring white-label solution for the consumer OTT market segment complements its NUViA white-label Unified Communications-as-a-Service (UCaaS) offering. 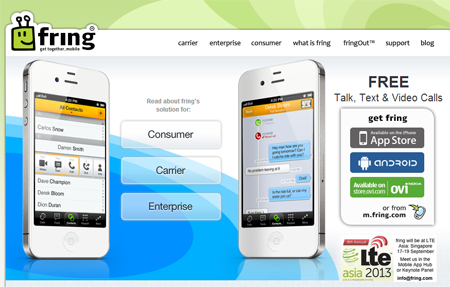 “fring is one of the pioneers that helped change the way consumers communicate on-thego and is perfectly aligned with our trategy to bring service providers rich, simple-to-use, mobile communications solutions,” said David Walsh, CEO of GENBAND. “The fring team and technology enhance our ability to serve our customer base of over 700 service providers around-the-world, fortifying them with a proven platform they can white-label to bring their own brand of OTT services to subscribers." Gogo plans to deploy a proprietary, hybrid Ground-to-Orbit architecture by the second half of next year that would combines existing satellite technologies with Gogo's Air to Ground (ATG) cellular network. The technology will use satellite for receive only (transmission to the plane) and Gogo's Air to Ground network for the return link (transmission to the ground). Gogo will be utilizing a Ku antenna developed specifically for receive only functionality. "When we launched our in-flight Internet service five years ago, we were able to deliver 3.1 Mbps per aircraft through our Air to Ground network. About a year ago, we began rapidly deploying our next generation Air to Ground service that took peak speeds to 9.8 Mbps. GTO will now take peak speeds to more than 60 Mbps. That's a 20-fold increase from where we started," stated Gogo's president and CEO, Michael Small. Virgin America will be the launch partner of the new service, which is expected to be available in the second half of 2014. Qualcomm announced a new $5.0 billion stock repurchase program, replacing a similar $5.0 billion repurchase program launched in July underwhich the company has already repurchased approximately 40.1 million shares of common stock for approximately $2.7 billion. "In recognition of our strong financial position and business model, we are pleased to have recently completed significant stock repurchases and to introduce a new $5.0 billion stock repurchase program," said Dr. Paul E. Jacobs, chairman and CEO of Qualcomm. 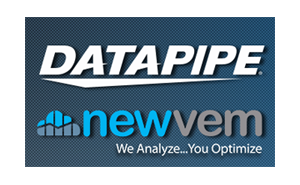 Datapipe, a global provider of managed services and infrastructure for outsourced IT and cloud computing, has acquired Newvem, a start-up specializing in cloud usage analytics and operations optimization. Datapipe said the combination of its managed IT services with Newvem's cloud optimization platform empowers enterprises to easily deploy, govern, analyze, optimize, and manage their workloads on the AWS cloud to meet specific business requirements. "Datapipe's acquisition of Newvem is aligned with our commitment to be the industry leader in managed cloud services for the enterprise,” said Robb Allen, Datapipe CEO. “Combining Datapipe's proven enterprise IT and cloud services with Newvem’s cloud optimization platform provides our clients with 360 degree insight into cloud operations and optimization." The Open Networking Foundation (ONF) and the Open Networking User Group (ONUG) announced a partnership allowing input from ONUG’s end-user community to help shape the future of the SDN movement. As part of this collaboration, ONF is supporting ONUG Fall 2013, a two-day event Oct. 29-30 in New York City. The event includes the ONUG Academy, a day of tutorials and workshops open to the industry, and the ONUG Conference, which will include user case studies, interactive business discussions, and networking opportunities for IT leaders. Rob Sherwood, chair of the ONF Architecture Framework Working Group, will present a tutorial on “Integrating OpenFlow and OpenStack” at the ONUG Academy. Ecuador's Corporacion Nacional de Telecomunicaciones (CNT) has selected Alcatel-Lucent to deploy the nation's first 4G LTE network in Ecuador. The deployment will cover the cities of Guayaquil, Cuenca, Machala and Loja, as well as most of the major cities in Ecuador´s Pacific Coast and Southern area. The new network will provide download speeds of up to 100 Mbps and upload speeds of 40 Mbps, enabling CNT to offer enhanced fixed, mobile and convergent services, such as high definition video streaming to a wide range of customers in Ecuador. Alcatel-Lucent will supply its 4G LTE base stations and the 5620 Service Aware Manager (5620 SAM). Agreement follows successful trial in Amazonas and Estadio areas of Quito conducted earlier this year by Alcatel-Lucent and CNT. Financial terms were not disclosed. AppDirect, which offers a cloud service marketplace and management platform that enables companies to distribute web-based services, has acquired Standing Cloud, another start-up offering cloud management services, such as automated software packaging and orchestration. Founded in 2009, Standing Cloud has deployed services with a range of cloud partners, including Amazon, Rackspace, Savvis, IBM, and others. Its catalog of integrated software features more than 100 applications, including Drupal, Magento, SugarCRM, and WordPress. The company has received $10 million in funding, completing its Series B round in late 2010. Standing Cloud is located in Boulder, Colorado, where the team will continue to be based. AppDirect helps service providers to launch online application stores within a matter of weeks. The company also helps developers to integrate once and make their software available across multiple marketplaces worldwide. 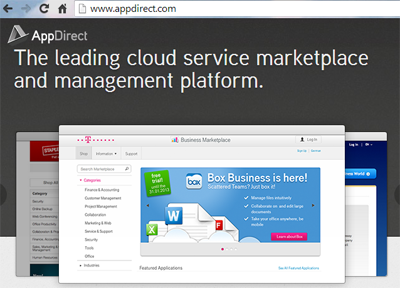 AppDirect powers the cloud marketplaces of Deutsche Telekom, Rackspace, Appcelerator, etc. The company is based in San Francisco. As part of the acquisition, AppDirect will become part of the Foundry Group portfolio of companies, which has invested in Zynga, SendGrid, CloudAbility, and Standing Cloud, etc. AppDirect also announced $9 million in Series B funding led by iNovia Capital.